The Historic Monuments of Ancient Nara comprise Buddhist and Shinto religious buildings that show the evolution of Japanese architecture. The temples are to be found in an exceptionally touristy park, with spoilt deer that roam around the walking paths. When I visited the site, it was also very busy with schoolchildren and elderly people (although it was still early in the morning). Very special is the Nigatsudo-temple, which is decorated on the outside with hundreds of lanterns. The way to the temple is aligned by stone lanterns. One of the many delights of this stunning site, an easy day trip from Kyoto, besides the the two huge carved wooden guardians of the temple, is the admonition near the entrance gate to be careful a deer does not eat your ticket. Even for those who might feel "templed out" the site is unique and worthy of its world heritage status. I visited here in 2007. Nara is a former imperial capital of Japan and served as the capital before Kyoto. While there are many attractions here, the biggest (literally) is the Todaiji Temple, which is the largest wooden building in the world. It makes for a great bookend with Hyruji if you like wooden building superlatives. You can visit Nara via a day trip from Kyoto, but I think there is enough there to justify at least an overnight stay if possible. 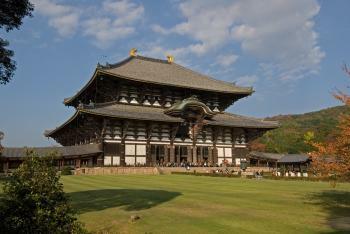 Read more about the Historic Monuments of Ancient Nara on my website. 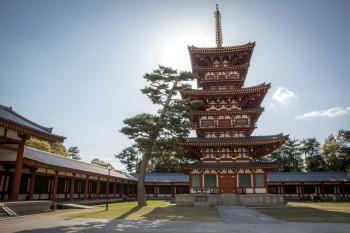 Seven constructions within Nara have been designated as part of an official World Heritage Site. Although there are other things to see, together they form the best examples of the ancient capital and the religious and political significance of the city. All of them can be seen in a day, if you rush. However my highlights are Todai-ji and Kasuga Grand Shrine. Read more from Michael Turtle here. Nara is probably the most underrated historical place anywhere in Japan. Within easy reach of Kansai International Airport by a reliable limousine bus service in just under 90 minutes. But careful: the last trip is at 20.40h. After that just via Osaka. I stayed with Takeshi Hamano at Guesthouse Nara Backpackers (confy beds dorm beds for 23 dollars, wifi and of course tea included) in Yurugi-cho, a very cozy 90 year old wooden building that served in its previous life as a Japanese tea ceremony house. Its quietly and conveniently located inbetween Kintetsu station and Nara-koen, the huge park to the east of the city where you can find most of the temples.Also the park is home to 1,200 deers, freely roaming around in search of shika-sembei, the delicious deer biscuits.At the time of my visit it was the pregnancy season, and I was told that most of the pregnant mama deers are kept indoor (in a place called Rokuen), as they could attack visitors when approached in their string maternal instinct. Rokuen is open for public viewing of the newly born deers during the whole month of June. 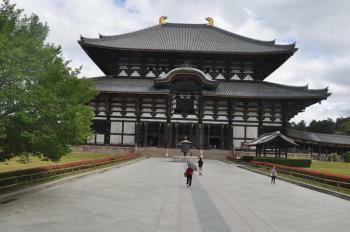 The highlight of any visit to Nara is of course the world heritage site of Todajij Daibutsu-den which is the largest wooden building in the world. A truly impressive structure, and to imagine that the original building was even wider by about one third of the present size, rebuild in 1709. Inside is yet another world record, the famous Great Buddha (Daibutsu), with 437 tonnes of bronze one of the largest bronze figures worldwide, with a height of 16 meters. I did the walking tour recommended by Lonely Planet and visited the temples of Nigatsu-do and Kasuga Taisha that is now charging a 500 yen entrance fee. Another gem in Nara's Unesco crown are the Kofuku-ji pagodas which served as tutelary temples of the Fujiwara family starting 710 when they were transferred here from Kyoto. Japan's first World Cultural heritage site (since 1993) is located in Horyuji, just a short trip out of Nara City by JR Kansai Line. In front of the train station in Horyuji, the connecting bus 72 is already waiting for the short hop to the temple complex.Here you will find the oldest surviving wooden structures (6th century, Asuka period) in the whole world, so its possible to see the biggest and oldest in just one day! Horyuji contains over 2,300 important cultural artefacts.The Gallery of Temple Treasures (Daihozoin) houses the most precious pieces like the Tamamushi Tabernacle which was the private property of the Imperial Family before or the nine headed Kannons, carved from sandalwod, and brought here from China.Also the famous Yumechigai Kannon statue has found a resting place in this newly constructed (1998) museum and attracts thousands of visitors every day. I found myself with many school classes, but avoided the long queues by politely asking permission to the friendly lady teachers! I visited this WHS in November 2009. The highlight of my visit was huge seated Buddha in the Imperial Palace. All the Buddhist temples and Shinto shrines can be explored amidst a Japanese garden setting with the occasional deer grazing freely. 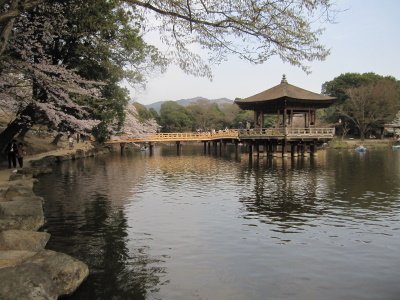 Nara was the first capital city of Japan, in the early 8th century, after the title was moved to Kyoto. However, the city kept its important cultural status in traditional Japan. I have spent three days visiting the numerous marvels of the town. The Todai ji, a huge temple 56 meters high that houses a huge bronze Buddha statue 16 meters high, is the main attraction. The place is amazing by its greatness and the beauty of the detailed decoration it welcomes. The building deserves the attention it is given. Very close is Kofuku ji temple with its famous 5 story pagoda, the second tallest in Japan after the one of To ji in Kyoto. While walking in the street and within this temple, you can see and caress the numerous deers that have been living freely in the city for centuries. Their existence is due to the fact that centuries ago, it was decided by one of the leader of the place that deers would not be killed anymore and would be venerated. Among the other places of interest, we have Gogu ji temple with its Hondo, main hall, and its roof where some part parts are covered with the oldest tiles and the Yakushi ji temple with its colorful buildings. 1,300 years old Nara or Heijo-kyo was the first permanent capital of Japan with many ancient beautiful temples and shrines in the one large park that full of hundreds of roaming deer, was maybe the most important tourist attraction after Tokyo and Kyoto. Unlike Kyoto where modern and ancient were combined, Nara was clearly divided into two area, the modern city of Nara in the west and Nara Park with Naramachi area, where most of the main tourist attractions located, in the east. The must visit places were the grand Todai-ji Temple and the brightly Kasuga Taisha Shrine, the main temple and shrine during Nara was a capital. Todai-ji was well known for its Daibutsu Hall, regarded as the biggest wooden building in the world with gigantic bronze Buddha statue, while Kasuga Taisha was famous for hundred of stone lanterns decorating the routes to the shrine, and both places were, again, full of deer. These two places were exceptional and should be seen if in Nara; however my favorite place in Nara and would like to recommend were Kofukuji Temple, its pagoda were the second highest in Japan. The views of Kofukuji at Sarusawa pond by night were one of the most memorable scenic spots on my every Japan trip. Also the view of Kofukuji from the outdoor onsen baht of Asukasou Hotel at dusk was totally breathtaking with its eternal serenity, dipping in onsen baht while watching the pagoda was a lifetime experience. Nara was maybe overshadowed and compared by nearby Kyoto, but Nara had all the needs of tourists, great hotel, lovely people, good food, beauty cultural sights and hundreds of cute but annoying deer. Nara was the must to see at least one time while visiting Japan, but for me every time I came back, Nara was proved to be better and better to linger on. My favorite is Gangouji temple. The Gangouji temple is a small, simple, archaic temple. This temple was a place of commoners' prayers from the Middle Ages. It is different from the big temples protected by emperors, aristocrats, and Samurai. The Gangouji temple is located in an old urban area outside the park. Therefore, few tourists come there. You will be able to see the temple calmly. A present Daibutsu building was rebuilt in 1709. It is already historical monuments of the Edo shogunate age. There is no reason to destroy it and to rebuild it again. For me, the Toshodai-ji was more interesting than the Todai-ji. In particular the museum with the temples treasures was the highlight for me. Passed up the chance to gawk at the Daibutsu, but went to see the Shoso-in instead. The central figure is heavily restored and somewhat squat in its' proportions and cramped in its' surroundings. It may help to know that the present building, in only two-thirds the size of the original one. They couldn't find enough big trees to re-build it properly the last time. I'll wait until they re-build it right. I visited Nara in 1994 and 2004. There is nearly no change during this ten years. The sites are not beautiful but the importance is higher than the sites in Kyoto. It is because Nara is the first ancient capital in Japan. Despite the touristy nature of virtually all of Japan's ancient sites, Nara is one place where you can get some idea of what Japan used to be like before everything old was almost entirely replaced with concrete. Todai-Ji is a magnificent building and the Daibutsen Buddha is a jaw-dropping spectacle. This is, without question, the star of Nara-Koen and possible the highlight of all of Japan's cultural relics. The rest of the park is also fascinating, with the 5 storey pagoda of Kofuku-Ji another gem. The Ancient forest (also on the World Heritage list) at the back of the parkland is well worth hiking around for a few hours. It's a great way to get away from the crowds. Gold Surfaces: Todaiji's golden horns on the main building roof. Giant Buddha statues: Todai-ji Daibutsu, Height: 14.98 m, "the world's largest bronze statue of the Buddha Vairocana"
Legends and Folk Myths: Tame deer roam through the town, according to the legend, a mythological god Takemikazuchi arrived in Nara on a white deer to guard the newly built capital of Heijō-kyō. Since then the deer were regarded as heavenly animal to protect the city. Undergoing Restoration or Repair: The East Pagoda at Yakushiji Temple is currently being renovated and is covered by scaffolding; the restoration should be completed in 2019. Cultural landscape not recognized: 1997 AB eval states "the Nara Palace Site, the Kasuga-Taisha Compound, and the Kasugayama Primeval Forest are sites, whilst the latter two are also associative cultural landscapes"
272 Community Members have visited.